Achieving breakthrough in business or cultural results requires people operating at higher states of thinking and acting. The mindset and behavior of blaming curtails high performance. Blame culture is the single largest drain of human potential in organizations and will prevent you from achieving the breakthroughs you need to achieve your vision. 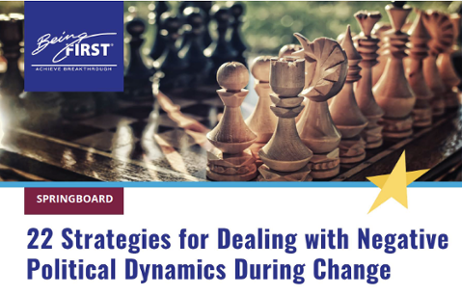 When things do not go according to plan during the stress of organizational change, it is a common human reaction to look for the person to blame. Anytime you blame – yourself or others – you are not owning your contribution to a problem. Denying how you contribute to a problem or mistake and blaming others guarantees conflict. It divides people, triggers defensiveness and aggression in others, and diminishes possible learning and growth. Blaming carries no benefit and is a downward spiral that readies you and your organization for more failure. How can you reduce the blame and judgement that arises when things go wrong? Shifting from a mindset of blame, to a mindset of responsibility and accountability can radically alter your corporate culture and lead to unprecedented breakthroughs. The words “responsibility,” “personal responsibility,” and “accountability” are often used interchangeably. They are related, but different. To co-create and learn together to achieve their full collective potential, people must be both responsible and accountable. Responsibility is fulfilling the requirements of your role. Personal responsibility comes from knowing you are the source of your thoughts, feelings, behaviors, decisions, actions, and ultimately, results. It comes from realizing you catalyze your life experience from “the inside out”. You are the cause of how you feel, rather than being a victim of external forces that “make” you feel the way you do in any moment. Operating as a victim of external circumstances is the opposite of personal responsibility. The core of personal responsibility is realizing that your mindset creates your reactions to external circumstances, which influences your ability to fulfill the requirements of your role. In other words, personal responsibility refers to an inner state of being, while responsibility refers to external actions and results. Personal responsibility is the foundation of personal development, self-mastery, and individual high achievement and excellence. It unleashes full human potential. Without it, individuals always under-perform and contribute less than they could have. People with inner personal responsibility achieve greater success at meeting their external “responsibilities”. Likewise, teams and organizations comprised of “responsible” individuals always out-perform teams of victims. Being personally responsible is a challenge. It requires courage, emotional intelligence, and a commitment to introspection and personal growth that most people simply do not have. 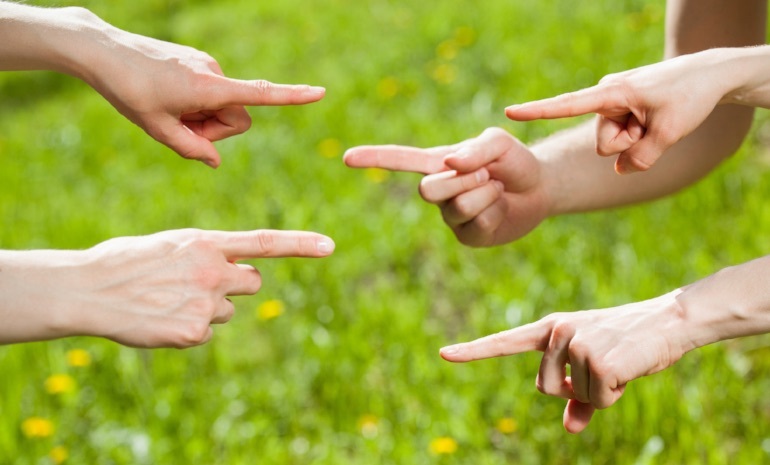 The blame game, with finger pointing and denying, is far easier and more common. However, even the best of people oscillate between being personally responsible and feeling victimized. The key, of course, is to be consciously aware and catch yourself when you begin to operate as a victim, and then quickly alter your mindset and behavior to become personally responsible for your inner reaction and state. 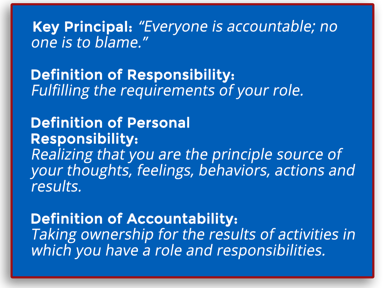 Accountability is taking ownership for the results or activities in which you have a role. Being accountable requires personal responsibility, as your results will always be influenced by your inner state. If you do not take responsibility for your inner state, you cannot fully own your accountability. Imagine a company culture in which everyone is clear about the distinctions between personal responsibility, accountability, and blame? What if people do not fear stepping up and declaring where they are responsible – both in their mindset and actions – when things aren’t working as planned? What if each person is always looking at where and how they are responsible, rather than blaming themselves or others? This isn’t to suggest that everyone has equal responsibility or accountability in a situation. Clearly, different people have different levels of responsibility and associated accountabilities. The breakthrough is when people each look within themselves and ask: “How was I accountable?” “What did I miss?” “Given my role, what did I not contribute that was needed for success, and how could I have provided it?” “Where was my mindset short-sighted or blind to a critical insight?” What becomes possible in this scenario is that people become more solution-oriented. They share in successes and look together to resolve problems when they arise. This reflective, “we are all accountable” mindset puts everyone in a co-creative learning orientation. It builds relationships, trust, and a solid foundation for achieving the breakthrough you are going for. It unleashes all involved to achieve their collective best.